UC's Lick Observatory offers its 25th season of evening programs for music lovers and astronomy buffs this summer, featuring concerts, lectures, and opportunities to view the night sky through the observatory's history-making telescopes atop Mt. Hamilton. Audience members will take turns at the historic Lick Telescope, weather permitting. Tickets go on sale this week for two series of public events: the Music of the Spheres concert series and the Summer Visitors Program. Music of the Spheres is a benefit summer concert series whose proceeds support the UC Observatories/Lick Observatory (UCO/Lick), a multicampus research unit headquartered at UCSC that serves over 100 UC astronomers. Each of the six Music of the Spheres evenings combines a performance by world-acclaimed musicians and a lecture by a renowned astronomy researcher. Afterward, audience members take turns at the historic Lick Telescope, a 36-inch refractor that has been in operation since 1888 and remains the second largest refracting telescope ever built. A cadre of well-trained volunteers assist in these events by sharing their own telescopes and expertise with interested members of the audience. Music of the Spheres concerts will take place on June 24 and 25, July 29 and 30, and August 26 and 27. For details on each concert, visit the Lick Observatory web site. Tickets for each Music of the Spheres evening are offered at three levels: standard ($40), preferred ($100), and VIP ($150). All tickets include the concert, astronomy talk, viewing session through the 36-inch telescope, and a commemorative wineglass or coffee cup. Preferred ticket holders have the additional benefits of reserved seating and a 20 percent discount at the gift shop. 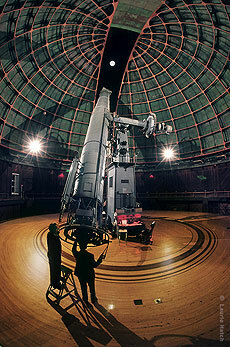 A VIP ticket further entitles visitors to a private tour of the 120-inch Shane reflecting telescope and a light buffet. Tickets for Music of the Spheres can be purchased from the UCSC Ticket Office at (831) 459-2159. Preferred and VIP tickets will be available starting May 17 and standard tickets starting May 20. For additional information, visit the Ticket Office web site. The Summer Visitors Program gives the public access to both the 36-inch Lick Telescope and the 40-inch Anna Nickel Reflector, a telescope scientists currently use to spot planets outside the solar system. As with the Music of the Spheres events, amateur astronomer volunteers provide additional outside viewing and informal talks. Each program also features two speakers to ensure an interesting evening even if bad weather prevents stargazing. The lectures include a history of Lick Observatory and multimedia presentations by Lick astronomers. Dates for the Summer Visitors Program are July 15 and 16 at 8:30 p.m., August 12 and 13 at 8 p.m., and September 9 and 10 at 7:30 p.m. Tickets are $5 and will be made available through a lottery system, with a limit of four tickets per request. Ticket requests can be made from May 16 through May 29 using an online form (which will be available for those two weeks at http://www.ucolick.org/public/svp) or by mail (SVP, PO Box 85, Mount Hamilton, CA 95140). Additional information about the program, as well as directions and maps, is available online. An added attraction this year is an exhibit of paintings by acclaimed artist Chesley Bonestell. The Bonestell exhibit, held in Lick Observatory's Main Building, commemorates the hundredth anniversary of the event that spurred Bonestell's interest in space art. Bonestell attended the Summer Visitors Program in 1905 and was most impressed with a view of Saturn through the Clark 12-inch refractor, which occupied the dome that now houses the Nickel 40-inch reflector. He painted a picture of Saturn as soon as he got home, and went on to produce a wide variety of astronomical paintings that have in turn inspired many astronomers' careers. Bonestell's works will remain on display at Lick Observatory through spring 2006. Lick Observatory is located on the summit of Mt. Hamilton in the Diablo Range east of San Jose. Driving time from San Jose is about one hour via Mt. Hamilton Road (Route 130). Founded in 1888, Lick Observatory remains among the most productive research observatories in the world.